Blue tourmaline is also known as indicolite and is a silicate crystal. It is categorized as a semi-precious stone that is used as an October birthstone. Indicolite is one of the rarest of the tourmaline gems and is mined throughout the world. This gemstone has a fascinating history, but the fact it is believed to have healing properties makes it all the more interesting. Indicolite’s color and affordable price makes it especially coveted by jewelry designers and its hardness makes it an ideal accessory for those looking for a unique piece to accent that special outfit or an investment opportunity. Indicolite has been around for centuries and, in fact, the Egyptians believed that the gem traveled over the rainbow, gathering its vast array of colors during its journey. Later, in the 18th century, Dutch scientists promoted the idea that feverish children could be put to sleep by wrapping the stone in silk and then placing it against their cheeks. About the same time, the wealthy began to wear the gems in jewelry; it was believed to ward off evil, dispel curses and protect the wearer from danger. Later, it was discovered the stone contained an electrical charge. Indicolite turns into a magnet, this occuring when it’s rubbed or heated in some way. It wasn’t long after that when people began to believe the stone would attract love as well as light objects. One of its most interesting features of blue indicolite tourmaline is that its the only crystal mined that is perfectly triangular. The gem is found in long, slender prismatic and striated columnar-like tubes. Its formation happens because the crystals grow in a trigonometrical system. That allows it to change colors when viewed from different angles. The property is called pleochroism. Indicolite is a crystal silicate mineral compound categorized as a cyclosilicate. It contains magnesium, iron, lithium, aluminum and/or potassium. Of the 14 types of tourmaline, blue is one of the rarest. Chemically, it is classified as an Elbaite with a chemical composition of Na(Li1.5Al1.5)Al6Si6O18(BO3)3(OH)4 and a 7-7.5 hardness on the Mohs scale. Tourmaline is mined where pegmatite, granite and gneiss veins formed at a 45 degree angle deep in the earth. Miners look for dykes and, once discovered, follow the vein collecting gems along the way. It is an accessory mineral found in igneous and metamorphic rocks. During hydrothermal activity, the crystals form in cavities and fractures. Unfortunately, during the mining process, only a small percent of the rock contains the gems and only about 5% of the tourmaline collected is categorized as gem-grade. Indicolite is allochromatic meaning it can come in a variety of colors. However, the light blue to bluish green indicolite is rarely found making it more expensive than other colors. Blue indicolite tourmaline is considered to be a guard dog and throat chakra stone associated with the planet Venus and the zodiac signs Leo, Libra, Scorpio and Taurus. It evokes tranquility by encouraging the release of emotional bonds bringing past hurts to the surface so they can be healed. Indicolite is frequently used to improve communication by allowing individuals possessing the stone to speak honestly from the heart. It is associated with compassion, the ability to identify causes of illnesses, and improve psychic abilities. The gemstone also encourages an open mind and tolerance while encouraging a sense of responsibility to serve others. Indicolite is believed to help individuals embrace a love of truth and ethics. It is a protective stone and harmonizes and balances chakras. The gemstone can ease bladder and kidney ailments and relieve problems with the pituitary gland, insomnia, throat, thyroid, adrenal gland, eyes, larynx and throat. Indicolite gemstones are often used as the birthstone for October, adopted by the American National Association of Jewelers in 1912. Those that are larger than 1-2 carats are quite valuable, whereas those ranging 4-5 carats are extremely rare making them very expensive. The larger the stone, the darker it will be. The most common form is dark greenish-blue while the rarest is medium-dark blue in color. Jewelry in all types and forms have been made from indicolite. The true blue form strongly resembles sapphire, which is why the price has been increasing in recent years. The biggest buyers are from Germany, Japan and Switzerland. The brightest of the blue indicolites resemble the London blue irradiated topaz. Many buyers are now seeing such a purchase as an investment and, most frequently, it is only found in one-of-a-kind jewelry. Because the colors are so hard to match from stone to stone, buyers can expect to pay 20-30% more for groupings. 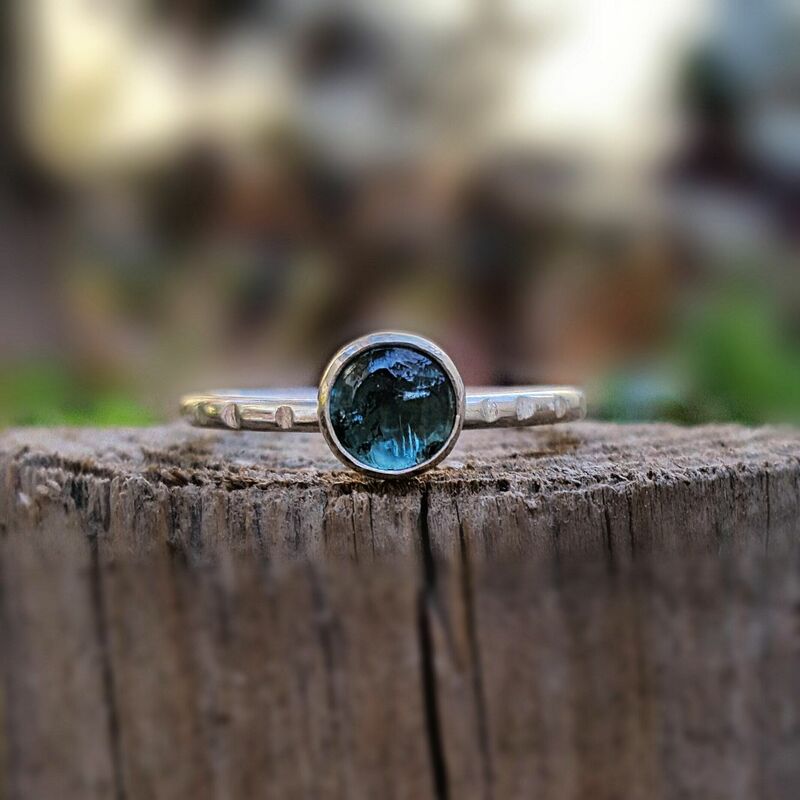 The blue tourmaline acquired its name from the Latin word for a blue-colored plant known as Indicum. The stones demand the highest prices of all gemstones in the tourmaline family due to their rarity. Due to its unusual properties, tourmaline will not scratch or break when worn. However, when cleaning, do not use an ultra-sonic cleaner or steam. It only takes a little soapy water and a small, soft brush to keep the colors and sparkle vibrant. Blue indicolite tourmaline was formally found in 1913 on the island of Elba, Italy, but Egyptian recordings prove it was around long before that. Since that time, it has been discovered in mining operations throughout the world. We can find it in Afghanistan, Africa, Brazil, Canada, Italy, Madagascar, Mozambique, Namibia, Nigeria, Pakistan, Sri Lanka, Tanzania, the U.S. in California and Maine and Zambia. It is believed that the best indicolites come from Namibia and Brazil, but in 1994 a huge deposit was found in Yukon, Canada. Blue indicolite tourmaline is a fascinating stone where healing powers are felt to surpass beauty. When looking at the cut gemstones, however, it’s difficult to believe that’s possible. Because of the shades of blue it comes in and its rarity compared to the other colors of tourmaline, it can make a great investment opportunity. It’s important, though, to weigh the importance of characteristics and properties in order to have such an asset pay off. What do you think? What’s more important: clarity, color or size? The experts are still debating. Share your thoughts below and help us clarify the question. Hey Buddy!, I found this information for you: "The Blue Indicolite Tourmaline and Its Healing Properties". Here is the website link: https://accessgems.com/blue-indicolite-tourmaline/. Thank you.